ELLLY Films, with 3 “LLL” is a newly founded film production and distribution company located in Vienna. ELLLY Films is through its international network of costumers, artists and stakeholders a very active member of the film business. Already coproduced and planned to produce are documentaries, portraying of glamorous personalities, as well as feature films. It was mutually decided in a workshop to emphasize the tradition of the great international film culture as core optical impression of ELLLY Film’s visual identity and an important issue for the owners to convey the emotional impression of the old black and white movies through the Corporate Design. 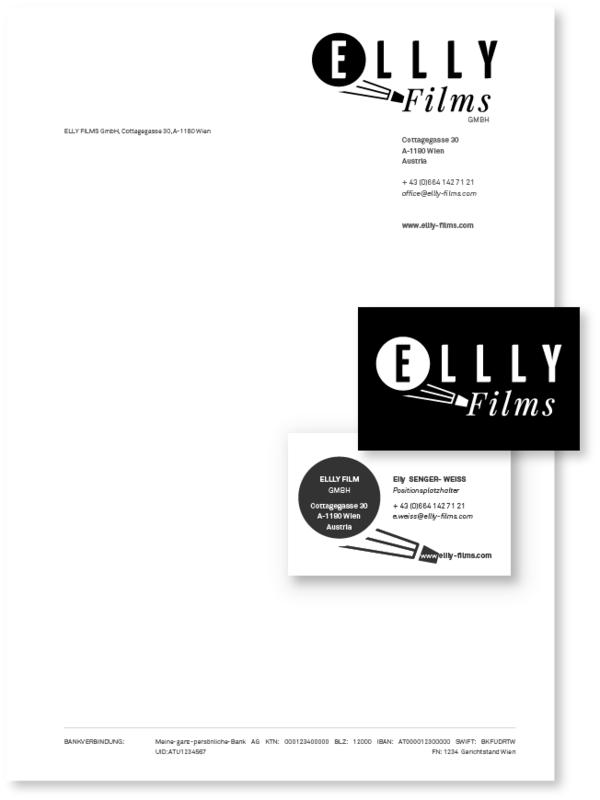 ELLLY Films is a young film company which exact company name already implicates their missions” Emotions – Love – Lust – Liberty – Yearning”. Therefore it was of great importance to find an emotional imagery that equates this strong statement. With the tradition of the classical film productions of the past and the ambition of this young company to be open as well to a curious young audience, the Atelier Zichy visualized obvious signals in the direction of Hollywood’s 1920th. In accordance with the client the Atelier Zichy created a Corporate Design that is referring to their objectives in colour, form and stile. The complete visual appearance of the company from all business print materials to future demands can be matched to these requirements. The fruitful cooperation with ELLLY Films enabled the client and the Atelier Zichy achieving the aims that they set out together.